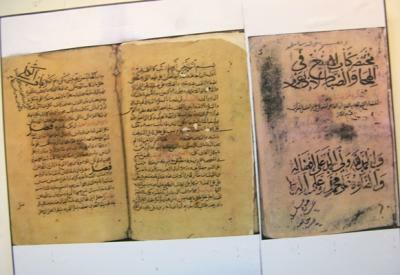 Almotamar.net - A report published in some official newspapers recently revealed futility of a factory for repairing the manuscripts , affiliated to Jumaa al-Majid Centre in Dubai and granted to Yemen , in return for allowing the Centre to photograph all he Arab and Islamic manuscripts existing in Manuscripts Houser in Yemen. This action is in accordance with the agreement signed by the Yemeni Antiquities and Museums Austerity and Jumaa al-Majid Centre in July 2008. In this regard, Secretary General of the national Museum Abndulaziz al-Jandari said I a statement to almotamar.net on Saturday that it is necessary that such agreements should be just and fair forth two sides. He presumed regarding this matter that thee should be a reciprocal benefit, adding that the manuscripts are considered among the rare books and achieves development in the House where they are kept while the tools and equipment have no relation to the history and books are the civilization of nations. “I was hoping that the agreement with Jumaa al-Majid Centre would have observed this side,” al-Jandari added. The subject of the agreement has aroused much uproar among intellectuals and those interested in antiquities and manuscripts in Yemen. The head of the Antiquities and Museums Authority Dr Abdullah Bawazir describes the a agreement as ‘excellent and useful ‘ for Yemen and that it secures for Yemen a factory for repairing and training and qualification as well as supplying the Manuscripts House with furniture. Contrary to that the officials at the House view that photocopying the manuscripts as representing squandering of them. Al-Thawra newspaper tourist supplement has quoted the secretary general of the manuscripts House Abdulmalik al-Maqhafi as saying the agreement is not identical to the agreement draft that was previously submitted. The draft agreement included that the photocopying should be reciprocal, i.e. what is photocopied for the Jumaa al-Majid Centre should be likewise to photocopying for the Manuscripts House. Professor of Islamic Antiquities at Sana’a University Dr Ali Saeed Saif deemed the photocopying of the manuscripts and departure of those photos from Yemen as an incorporeal and material loss altogether. Dubai, but not Sana’a will, through al-Majid Centre, be the place where researchers will go for their researches. Meanwhile, two international experts in the field of manuscripts revealed in their report the uselessness of the factory for manuscripts but rather it is good for books and newspapers. And after examining the factory it has appeared that the country of origin was deleted and the name of Jumaa al-Majid Center was put instead in addition to absence of a manual of instructions about the apparatuses . For his part the Culture Undersecretary for the manuscripts sector Sam al-Ahmar denied the possibility of carrying out the agreement. He confirmed that the Centre has not photocopied the manuscripts and attributed that to the fact that the manuscripts are the heritage of a nation and no person whosoever has the right to deal with that. Such a person will receive the curse of history and generations, as he said.